Got the good old “Plenty” cookbook out this weekend and settled on this lemony fresh risotto. You can find the original version of the recipe from Ottolenghi over at The Guardian. From a risotto point of view, this is a really a basic one: oil, onion, garlic, rice, stock, butter and parmesan. That’s all. The grilled and fried aubergines, lemon zest, lemon juice and basil however add a ton of flavour. When searching (afterwards) for an online version of the recipe, I found out that the cookbook is actually slightly different from the original recipe with respect to preparing the aubergines. “Plenty” prescribes flame-grilling one of the aubergines over an hob – which is a bit difficult with my induction hob – and not oven-grilling as per the original recipe. I didn’t know that at the time, so I just followed my regular oven-roasting routine: pierce the aubergine with a knife a couple of times, rub some olive oil over it and put it in an 200C/400F fan oven for about 45 minutes. For more smokiness I would indeed suggest following Ottolenghi’s original recipe: oven-grilling on high for a full hour. On the (relative) downsides of this recipe, I would personally never again fry the aubergine cubes before starting the risotto. In the meantime they cool down completely and lose their crunchiness. We all found these cold aubergine cubes really out-of-place in the hot risotto. In this respect there is again a difference between the recipes: “Plenty” only uses 80ml of oil to fry the aubergine cubes rather than the 120ml from the original recipe. The 80ml was indeed plenty… (my apologies for this terrible pun). Furthermore, you have to be careful with adding the lemon juice at the end of the cooking time of the risotto. I only added half as you also finish with lemon zest, but it already was almost too tangy. The recipe was easy to follow and apart from the lemon juice, the measures of the risotto ingredients work well together. It serves 4. The cold, soggy aubergine cubes can easily be avoided by starting to fry them before you add the last ingredients to the risotto. 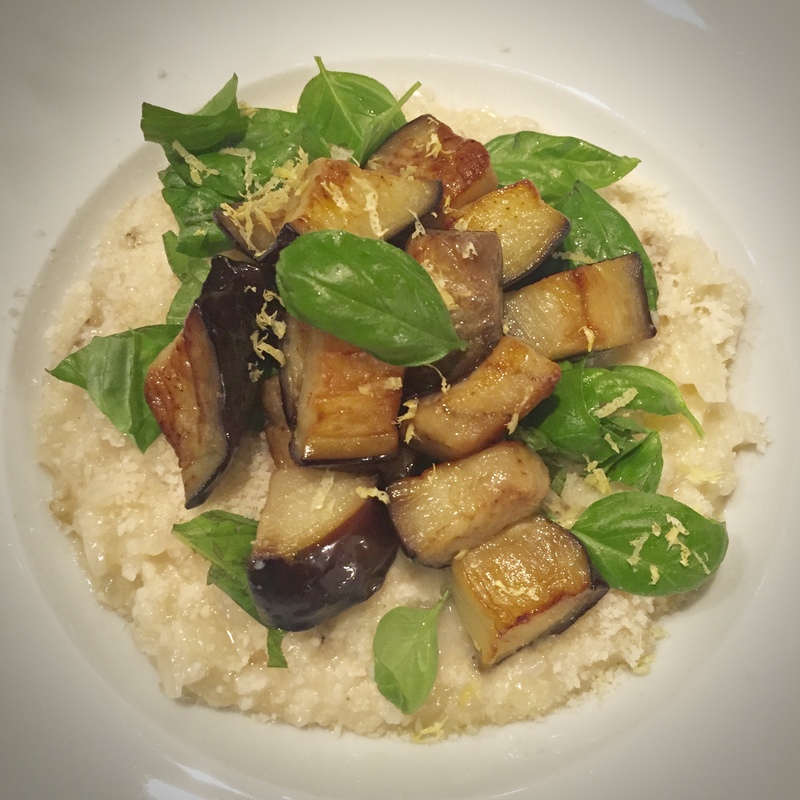 As the risotto then needs to rest for 5 minutes, this should give you enough time to fry the aubergine cubes on high heat and put them on some kitchen towels to drain off any excess oil before serving.